The two Camonna Tong Thugs live at Walker Camp and are part of Dulfish gro-Orum's skooma-smuggling operation. They are members of the Camonna Tong, a crime syndicate from Vvardenfell. They have relatively low confidence and are likely to run away after a brief spell of combat. This thug specializes in melee and is armed with a leveled blunt weapon. He wears a set of leveled light armor consisting of boots, a cuirass, greaves, and gauntlets. He also carries a second pair of enchanted light greaves and a pair of breeches. He may also carry up to two poison potions and a lockpick. He also carries a large amount of gold that, due to a glitch in the leveling system, may reach several thousand coins. He sleeps in the camp's tent from 10am until 4pm and then explores the area near the camp until 8pm when he sits and eats a meal for four hours. At midnight, he resumes his patrol before eating breakfast at 8am and heading back to bed at 10. If he has any skooma, at midnight between Turdas and Fredas he will take it to the hollow rock near Kingscrest Cavern and leave it inside before returning to his normal schedule. 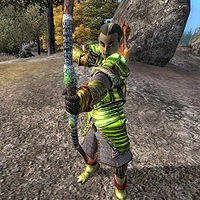 The second thug is an archer, so he is armed with a leveled bow and arrows, although he also carries a shortsword. His armor consists of leveled light boots, cuirass and gauntlets. He may also carry up to two poison potions. His only other possessions are a set of spare clothing (breeches, a dark green shirt, and stitched leather shoes) as well as a few gold coins. His schedule fits around his colleague's activities to ensure at least one of them is always awake. He sleeps from midnight to 8am and goes on patrol while his associate eats. At midday, he eats his lunch before resuming his exploration of the local area at 2pm. At 8pm he joins the other thug for their evening meal. 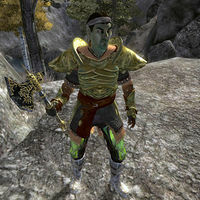 If at any point his colleague heads off to deliver skooma, he will follow and help him with any combat before resuming his usual schedule. This page was last modified on 22 December 2018, at 00:15.